Stoos is located in the Alp world of inner Switzerland 1300m above sea-level. This was once a region dominated by shepherds and farmers. Till 1933 you could go to Stoos only by foot, along a steep trail via Morschach or Ried (Muota Valley). The shepherds and alpine farmers used to climb up to the mountains in the summer months and live there in simple alpine huts, which provided shelter for the humans and domestic animals. They were acquainted with and used the lush green grass and medicinal krauts (herbs) found on the alpine meadows and on the slopes of the hills. The Swiss shepherds are a religious folk and know basically no other goal than to live their Christian lives, and to die happily. This is the reason why you find so many mountain-chapels in good olde Schwyz. The pretty chapel called Maria Hilf on Stoos was constructed for the alpine farmers and their families in 1721. The farmers and alpine people visited the Sunday religious celebrations where they could get compassion and help. 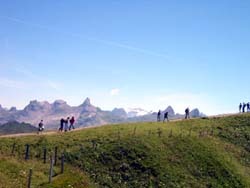 A priest from Schwyz was obliged to climb all the way to Stoos every Sunday. He had to have an empty stomach up the steep climb, because of an old law in those days. After the holy mass, and having given the holy sacrament to his believers, he was obliged to leave the mountain world and return to monastery in Schwyz. After a fire which destroyed the chapel, a new one was constructed in 1932. In the inner chapel is a picture of Maria Hilf, which shows the holiest virgin Mary with her God-son on her arm, surrounded by angels. It’s one of those imitations of the picture by Lucas Cranach (1472-1553) which can be seen in Innsbruck (Austria). The wooden alter dates back to 1721 and the statues of Holy Francis of Assisi, Wendelin and Antonius are dated 1720. In Hinduism Durga is the Great Goddess (Mahadevi), the consort of Shiva and the daughter of Himalayas (Himavat). Durga appears in the Mahabharata under different incarnations, and is also found in the Puranas. She is often known as Shakti, the female energy of Shiva, and has a mild and a fierce character. She is worshipped during the Durga puja celebrations in Nepal and India. In her mild form she is seen as Uma (the light), the yellow or brilliant Gauri, the Goddess from the mountains Parvati, Jagamata (the Mother of the World) and Bhavani. In the terrible, fierce form she is the inaccessible Durga, black Kali and Syama, and Bhairavi the terrible. Durga is depicted symbolically with ten arms to show her might. Like Durga, the Great Goddess in Hinduism, Maria Hilf is held in high regard as the victor over all battles of God and reaches to the glorious sea-victory over the Turks at Lepanto on October 7, 1571. It is said that the victory was possible through the power of the rosary prayer. Through this victory Christianity became the true faith and the Occident (Abendland) has thus remained Catholic. What I found most fascinating were the votive boards and artistic calligraphic documents to bear witness to prayers that were heard by Maria Hilf. 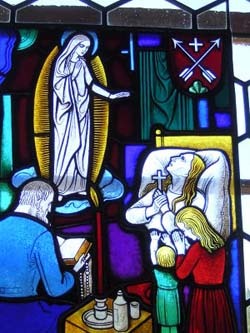 The memorial images for having been saved after accidents, rescued from illness, difficult situations in life, are a gesture of thanks to God. These thanks can be a plea and prayer for help for the well-being of the domestic animals or when a son has been commanded to fight for his lord or country, cured illnesses, like typhoid, sufferings, post-operative healing, avalanche mishaps, ski-accidents, a safe sojourn abroad. Such pictures are painted on wood, canvas, tin, paper or glass and donated to holy places. No profane paintings or kitsch whatsoever are allowed, and the images follow a strict composition. In the clouds there are the guardian angels, beneath which we find the objects of thankfulness or the plea (bed of the ill person), objects or causes of mishaps (falling tree, lightning or an avalanche in the Alps). 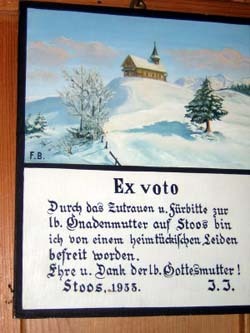 And at the end of the votive picture the name of the donor and the word: ex voto with the year. The inner walls of the chapel are replete with different ex votos from the 18th century, from the French kriegs and the Russian invasion in Muota Valley in 1798. Much like the Tamang, Sherpa and Tibetan tormas, the alpine folks also have their sacrificial objects (Opfer) as miniatures. The hunter of the Old Stone Age also painted the animas that they wanted to hunt on the cave walls, akin to their inner wishes and desires. In Nepal and South Asia sacrificial offerings are made either through the mediation of bahuns (priests) or shamans (dhamis, jhakris, bijuwas etc) and rituals are performed to the God or Spirit and to strengthen the protective powers. Dough figures called tormas, which are symbolically the causes of illnesses, are offered to the Gods and Spirits. The Dhamis, Jhakris enter a trance during a seance during which the entire village people take part. The patient is not alone and is a part of the village community in good and bad times. The votivs are made by a village artisan, carpenter or artist under strict rules. Even in these days of bits and bytes and globalization, votives haven’t gone out of fashion and can be seen in the shops, trains, trams, bus posters in the form of Sunday paintings, Nurnberger cake wrappings, logos and icons, and have in this way become rather aesthetic but profane. The plea to have one’s wishes fulfilled by a higher authority, namely God, and the presenting of the votive (ex voto) as one’s way of showing one’s thankfulness is called an Opfer in Germany, which means ‘sacrifice’or ‘offering,’ is a folks-art. The image or effigy which was regarded as the sacrificial offering retains its old magical meaning.